A very educational 1 hour and 44 minutes ♥ http://youtu.be/eLIrZg8kaqM Glad I watched it! Timelines and time travel to send your energy to the future or the past …. And change it. Stargates have been experimented with and travel only took a few seconds. This will eliminate traffic in the future. Creating our future using law of attraction. UN Agenda 21 says 85% of the world population has to be eliminated. Mobile phones are addictive and cause cancers, a part of the depopulation process. Scientists and medical doctors run tests using children to split the mind (split personalities), torture techniques are involved. We can send our energy anywhere in the universe. Many of us have come from other dimensions, other timelines, other planets. She talks about the elite with their symbolism, satanic rituals, secret handshakes and maybe this is their way of “calling in” to another dimension. Elite continue to supress the fact that we have “contact” because if the public found out that we have far more advanced technologies on other planets, the elites would lose their power. Barack Obama was selected (not elected). 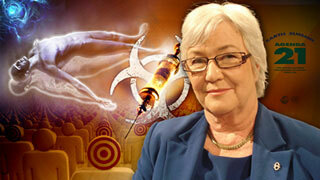 All the people that took the Swine Flu Vaccine are now mind controlled she says. The vaccine contained a chip in it. Bill Gates said that vaccines are part of the world depopulation program and vaccines contain a sterilising agent so people cannot reproduce. Dr Rauni then goes on to talk about the biggest weapon in the world – HAARP – and how it works and what it can do. When people first awaken to this, the first reaction is fear…. Until they start to actually “think”. Dr Rauni says we need to send love and light to the darkside, it is the only way. Love IS he way. Use telepathy. Send a telepathic message out to those on your same frequency saying – lets send the love and light now. Its time to work together, from the heart.